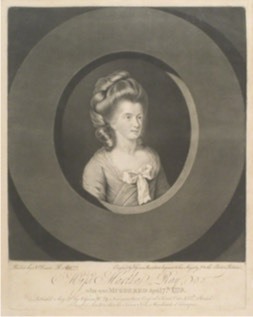 THIS FINAL EPISODE OF THE TALE OF MATHA REAY’S MURDER shows how the burgeoning Romantic movement, working with the gutter press of the day, transformed the story of Martha’s murder into a perfect soap-opera of star-crossed lovers and tragic death, even supplying the evidence for those elements of the story reality had, most inconsiderately, omitted. In my two previous posts, I set out the basic tale of poor Martha’s murder and the trial and execution of her killer, The Rev. James Hackman, Rector of the little parish of Wiveton, near Cley-next-the-sea on the North Norfolk coast, and traced his brief career in the Church of his day. In this post, I want to show how the media of the time reported and drastically distorted the story. In reality, the events surrounding Martha Reay’s death seem to have been the sad outcome of a young man becoming obsessed by the glamorous mistress of a peer of the realm. Finally convinced he could never have her, he decided to kill her instead, then commit suicide. Whether he saw the latter as a final act of romantic passion, or a simple escape from punishment, we can never know. At first, the media stuck to reporting the facts, but other questions soon arose. Why had he done it? Why should a clergyman, however newly ordained, commit the double sin of murder and attempted suicide? People wanted answers, but Hackman himself refused to explain any of his actions. What followed was perhaps not so surprising. The intense public and media interest focused on the handsome young clergyman, now seeming to await his fate with serene and noble resignation. James Hackman played this part with such skill that public opinion swung completely behind him. Newspaper and broadsheet accounts quickly became so favourable towards James Hackman that the victim, poor Martha Reay, was made to appear culpable for her own death! It was Hackman who became the tragic hero; she was cast as the heartless minx who led him astray – the classic story of a naive young man ruined by an evil, scheming woman. Never mind that there was no evidence whatsoever to support such a claim; an enterprising person was soon at hand to make up for that omission. Martha’s murder took place just when the set of values and outlook we call Romanticism was starting to become prevalent; the time of Wordsworth, Coleridge and Southey. To kill for love, if that was what Hackman did, was seen as more pitiable than evil. There is also the undeniable fact that the very notion of a clergyman killing someone seemed to call for an explanation beyond the ordinary. To be a priest in charge of a parish of the Anglican Church was to be part of the establishment – a gentleman in standing, if not always in terms of income. The reports of the time show that Hackman was treated with considerable kindness and courtesy, as befitted someone of his station in life; even though, in reality, his background, as we have already seen, was much more humble. For all these reasons, as well as the obvious benefit of selling newspapers, broadsheets and pamphlets, there was an outpouring of explanation, speculation and unattributed background. Newspapers vied to offer ‘authentic’ accounts of Hackman’s life, his prior relationship with Martha Reay and the reasons for the murder. Few, if any, of these were more than fantasy and imagination. Most presumed that Martha had first led Hackman on, then rejected him. Some claimed to know they had been secret lovers. Letters between them were published, which were almost certainly forged. How did an obscure cleric and the mistress of a prominent nobleman come to be involved with one another? What had she done to cause him to want to kill her? The newspapers of the day busied themselves with precisely these questions, producing a wide variety of speculations and assumptions. For the historian, looking at the event nearly 240 years later, the chance of providing a definitive answer to any of them is remote. Crime of Passion or Simple Obsession? Knowing nothing of the phenomenon of ‘stalking’ and the fantasies that occur in the mind of the stalker to help him justify his obsession, people naturally sought for more prosaic explanations as to why a young clergyman should murder the person he claimed to have loved whole-heartedly. With modern psychiatric knowledge, we might easily interpret his actions prior to the murder — sending her unwanted love letters, obsessively proposing marriage, following her around London that day, and finally turning to violence against her — as typical of an obsessive, unbalanced stalker; the people of 1779 took them at face value and looked in the past of the principal characters for an explanation. The modern media are happy to repeat almost any rumours or suppositions about a newsworthy event that might add to the drama and sell more copies, restrained only by legal threats. The eighteenth century was different only in the lack of libel laws, leading to an even more brazen use of rumour and guesswork to ‘spice up’ a story. Some broadsheet authors were willing to perpetrate outright fraud to sell a book. Such a one seems to have been Herbert Croft, whose book, Love and Madness, so muddied the waters around the murder of Martha Ray that some of its contents still appear in supposedly modern accounts. At the start then, all the prime characters were reported as more-or-less innocent victims: Hackman as a melancholic, sensitive young man driven temporarily insane by love; Martha Reay as the unwitting victim of another’s passion and her own attractiveness; and even Lord Sandwich as the doting, long-term protector of Martha, suddenly finding his lover snatched away by a cruel and totally unexpected fate. Soon after the trial and execution, broadsheets were already taking a different line. Hackman was still the maddened lover and penitent, but Martha was now a cruel temptress, who had led him astray with false hopes. A London bookseller, G. Kearsley, published an anonymous account of the affair which claimed to explain the full history of the relations between Hackman and Reay in these terms, together with an explanation of why the judge in the trial, Sir William Blackstone, had been unable to accept Hackman’s plea of insanity. Clearly even that reviewer couldn’t quite avoid wishing they had been true! Whatever Hackman’s intentions at the time of the murder, once apprehended he played the part of the noble penitent, driven to madness by love, to perfection. Whether this was more than an act it is impossible to tell for sure; nor can we tell whether his change of approach at his trial – to claim ‘temporary phrenzy’ rather than settled intent – was his own idea or was suggested to him by his defence lawyer or someone else. Certainly, the trial judge rejected it out of hand. Hackman’s deed inflamed the interest of the people of his time, and the media continued reporting the story in thrilling detail for years afterwards, inventing or assuming facts they did not know. In such circumstances, the simple truth never had a chance of emerging. This was the period of the birth of the novel, especially the sentimental novel, gently satirised by Jane Austen in Northanger Abbey. Stories of doomed love, such as Goethe’s The Sorrows of Young Werther (1774) were fashionable amongst the elite. Indeed, several accounts of James Hackman and his deed referred to him as ‘the English Werter’. To match the emerging stereotype, it was essential to portray Hackman and Reay as doomed lovers. Many readers wanted to believe Martha Reay had encouraged Hackman, even had an affair with him. After all, as the much younger, attractive and universally-acknowledged good-natured mistress of an elderly rake, the proper thing to do, according to the mythology, was to find true love in the arms of a handsome younger man – and Hackman appeared at the theatre that night, and later in court, as handsome, well-dressed and immensely plausible in his manner. It did not help matters that the Fourth Earl of Sandwich, Martha’s ‘keeper’, was deeply unpopular, being widely criticised, as First Lord of the Admiralty, for the poor showing of the Royal Navy in the American War of Independence – whether that was blamed on his incompetence, sloth or corruption depended on the speaker. Nor were his earlier links with Sir Francis Dashwood, the Hell-Fire Club and the Monks of Medmenham forgotten. The Earl of Sandwich in his own favourite form of ‘sandwich’! 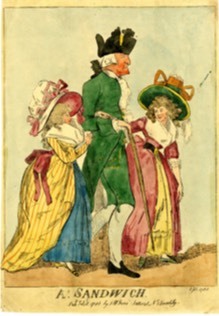 Satirical print published by S.W. Fores, 1788, and alluding to the earl’s fondness for young ladies. © The Trustees of The British Museum. Used by permission. Sadly for the sentimentalists, there is no actual evidence of any kind of ‘relationship’ between Reay and Hackman beyond good manners, kindness and perhaps the understandable pleasure shown by any woman at being admired and flattered by handsome young men. The Earl of Sandwich also seems to have been genuinely fond of Martha, if his response on first hearing of her death can be trusted. After all, they had been together for seventeen years and she had born him nine children, five of whom were still living at the time. His actual wife had been confined as ‘insane’ and does seem to have been genuinely mentally disturbed. Indeed he treated Martha pretty much as his wife, even betraying her with a number of other women, as was the custom of rich men of the time. We also know that Martha, at the time of her death, had been trying desperately to shake Hackman off from following her and pestering her with letters and proposals. She was devoted to her children and had been concerned from their births to ensure their futures; something which Hackman would have been unable to provide, even if he had wanted to. Would she have put all this at risk for love? It seems very doubtful to me. Hackman may have been obsessed, but Martha Ray seems to have been clear-headed. In her first letter, ‘Sabrina’ made clear she never knew Martha Reay, but was writing to direct compassion where it truly belonged. Perhaps heartened by getting her letter printed, she warmed to her self-appointed task in the next one. Her language grew more impassioned, both on behalf of Martha Reay and in anger at the tepid reaction of most women and the injustice of public opinion in general. Now ‘Cato’ strode forth to belittle Sabrina’s passion and intellect in a masterful display of male arrogance. If you wish to discredit the opinion of a woman, simply assert she must be a frustrated spinster! Perhaps we should leave the final words to Sabrina, who wrote a final letter in her own defence.